Home sweet home should be the safest place on earth for a child, but it can be full of hidden dangers. It is vital that parents recognise these potential threats and take the necessary practical measures to prevent injury. No matter where the dangers are, a curious child left unattended for even a moment is sure to stumble upon them. Yet bumps, tumbles, burns, fractures and more serious injuries can all be prevented by taking some common sense steps. Fit stair gates to the top and bottom of stairs. Fit door stoppers to prevent fingers being caught in the spine or catch of doors. Use socket inserts on electrical points. Cushion the dangerous edges of furniture. Keep toys to a minimum in playpens. Fit smoke detectors in the hall, landing, bedroom. Ensure fire guards protect open and gas fires. Tie up loose cables and keep them out of reach. Check the water temperature before a child is put in the bath and never leave the child unattended. Keep children away from glass doors and objects, including picture frames. According to the Royal Society for the Prevention of Accidents, in 2002 alone there were 416,806 children under four years old injured and taken to hospital due to accidents inside the home. Of those injuries, 111,623 were open wounds, 27,101 were bone injuries and 25,523 were burns. A worrying 229,805 were head or facial injuries, 93,726 were arm injuries, 39,278 were leg injuries, 192,167 of the injuries were caused by falls and 23,903 were suspected poisonings. Even the most responsible househusband can be distracted by the telephone ringing or another child requiring attention and a toddler can be off courting trouble. The distress caused when a child is seriously injured at home is immense, and the statistics show that there are plenty of dangers, so parents must make sure their home is as safe as possible. It is a good idea for a dad to get down on his hands and knees and get a toddler’s eye view of the world. 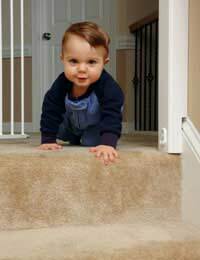 Start to think about making the home safe long before the baby starts to crawl. Untidy homes cause more accidents than tidy ones, so keep clutter to a minimum and pack away any ornaments that might tumble. By thinking about it, a host of potential dangers can be identified. For example: free-standing bookshelves can topple, so shelves should be secured to the wall; a baby’s head can get stuck in a cat flap; playpens are dangerous if piled high with toys, as toddlers may try to escape by climbing on the toys to get out; string on toys can get tangled around a child’s throat; small foam toys can cause choking; washing machines and tumble dryers can be dangerous hiding places if left open; a baby can drown in an inch of water, so be extra vigilant at bath time and get a toilet lock to stop inquisitive children falling in; cotton buds can be poked in eyes or swallowed, and even toothpaste and mouthwash are dangerous if swallowed in large quantities, so lock them away.